Four original games in an elegant display! PIN INTERNATIONAL presents the first four in an ongoing series of original and engaging games, designed as an adornment to the home and a treasure for generations to come. All are carefully crafted in renewable resource wood, at PIN's own factories in Thailand, to a quality that makes them a pleasure to handle, as well as to play. To further enhance their appearance, a stand has been designed to hold all four games. Freed from their box, the games look both elegant and inviting. Over the years, PIN INTERNATIONAL intend to continue expanding The Games Collection. Information about the different editions will be kept available for collectors by PIN's distributors. 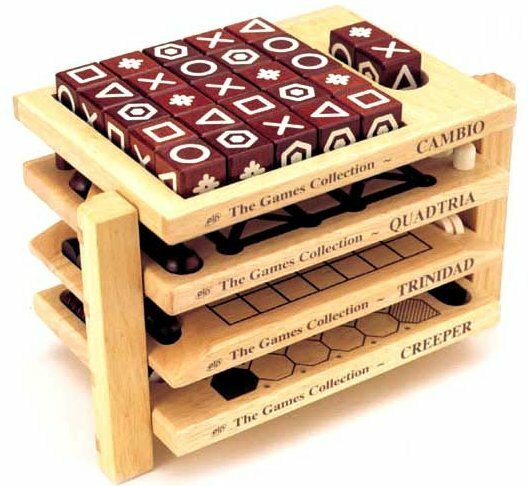 CAMBIO - Cambio is a game of skill for 2 players. The objective is to be the first to form a line of five of your own symbol. This is achieved by placing a cube at the end of a line and pushing it into place, which has the effect of changing the position of not one piece, but five. Although you cannot push an opponent off, you do have the satisfaction of pushing them around! - Invented by Maureen Hiron. QUADTRIA - A fun and easy to learn game in which a winning triangle pattern is formed by moving balls along passages in the ruins of four great pyramids. Quadtria is a casual, easily understood, yet compelling game, where strategy shifts like desert sand and a watchful initiative is essential. - Invented by Claus Peter Bickel. TRINIDAD - Your aim is to be the first of the two players to form a trio of your own pieces on the island set in the middle of the board. Movement is orthogonal. Capture is diagonal. However it can pay to sacrifice a piece in order to pull your opponent out of position. - Invented by Maureen Hiron. CREEPER - The two players vie to be the first to form a continuous chain of their own shade from one corner of the board to the other. Pieces are placed on the board by judicious movement of marauding pawns. But take care: these can be captured - and your carefully laid path turned to the advantage of your opponent. - Invented by Graham Lipscomb.